It's seed starting season! I try not to do much seed starting indoors since I actually produce better plants in cold frames outside, but it's really hard to resist sometimes. 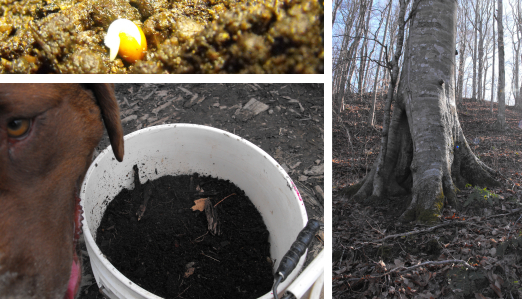 So I headed out to the ancient beech this week to collect some stump dirt. Two years ago, I cleaned the tree out, but last year I left it alone and six gallons of stump dirt have accumulated in the base of the hollow tree since then. A lot of people screen the stump dirt first, then bake it in the oven on low heat to sterilize it, but I am quite happy with just picking out the big bits of bark and using the stump dirt immediately. I do have to weed out a sprouted Jack-in-the-Pulpit or Greenbriar now and then, but I like having living soil. And, see --- a couple of days later, the broccoli seeds are already sprouting! I just wish we had more of these gracefully aging trees in our forest.